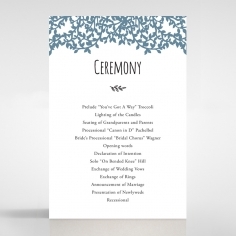 A simplistic yet meaningful wedding invitation for the couple celebrating their wonderful journey together. 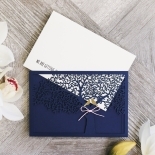 This sweet and memorable navy pocket style invite highlights a laser cut silhouette of a grand old tree wrapped with a dainty light pink satin ribbon on the trunk. 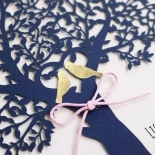 This design also includes two charming love birds perched on the branches and a sublime testament of a couple's love and devotion. 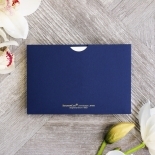 In addition, this invite comes with unique square-edged envelopes with peachy-coloured lining on the inside. 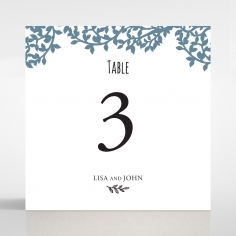 Add a personalised touch by choosing your own font printed in black raised ink, or your own text colour to suit your wedding style and theme. 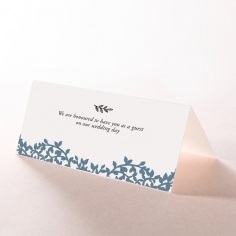 We ordered a sample of this invitation and we really like it. 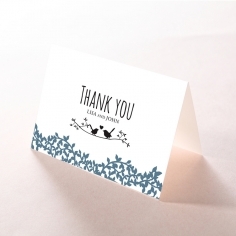 The laser cutting is perfect and the quality of the card, paper, and envelope is fantastic. 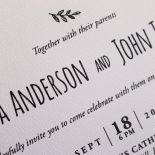 We liked the texture of the raised ink on the invitation itself. 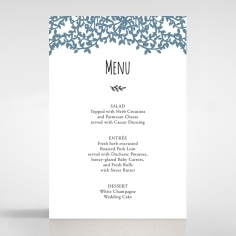 The design is lovely, with striking contrast that we like and a little bit of bright coloured detail as well. 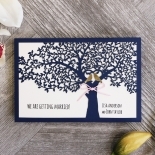 It really stands out as something unique and special and we are planning to order these for our wedding. 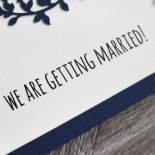 We were drawn to this invitation as it had a lot of similarities to our save the date. A sample was ordered and we were not disappointed. The quality of the paper is fantastic and the detail that has gone into the tree is unbelievable. 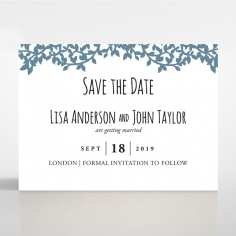 This invitation will now become the invitation for our wedding and I will be recommending to anyone who is looking for invitations for their special occasion. 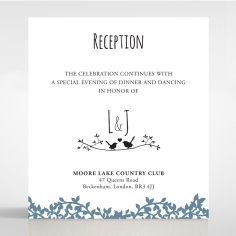 I will also be looking to order more invitations in the future. 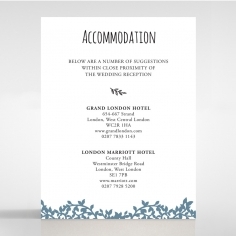 A big thank you to giant invitations for their amazing work on our wedding invites and stationary. 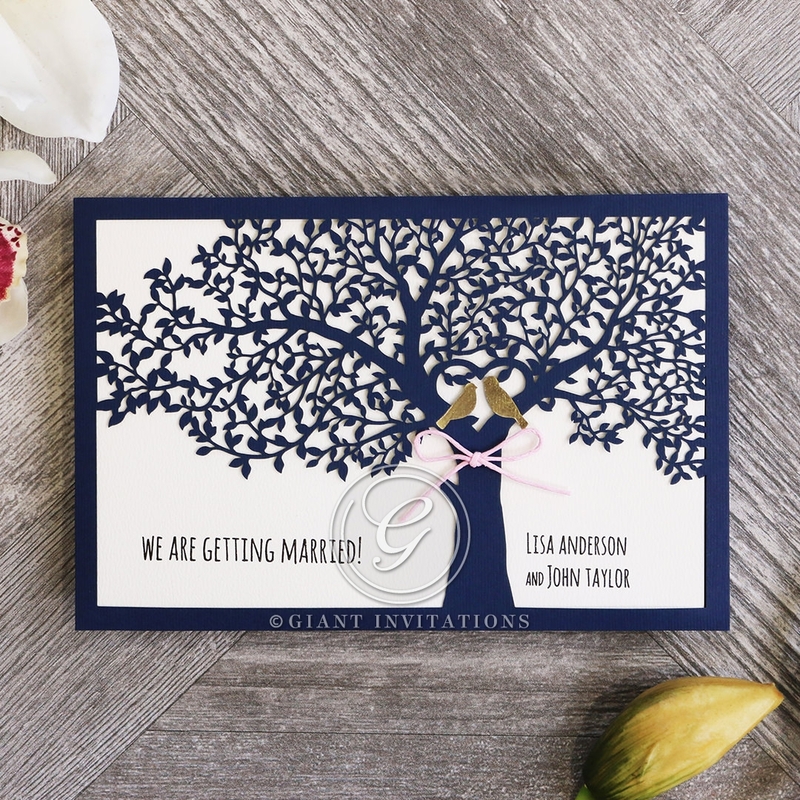 The Forest Love invites are such a beautiful range and we are so glad we picked these! The detail and quality of the paper within the product is outstanding. 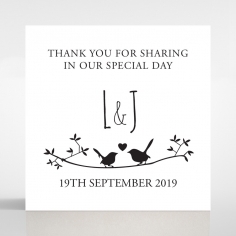 We have had many compliments from our guests on the invitations and could not be happier to have picked it for our special day.Thank you so much! Absolutely stunning! Really good quality and neatly presented. 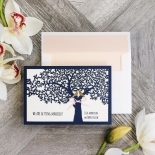 We love our invites as do our guests, every guest has commented on how gorgeous they are.They were packaged wonderfully so that all arrived perfectly. All communication to was smooth to make small amendments within our three edits. 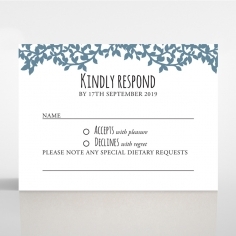 Would love to see these with other colour bow and envelope options. we ended up removing the pink bow and replacing with a gold ribbon bow to match our colour scheme. 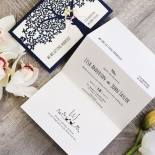 The sample we received of this invitation is even nicer than the pictures shown here. 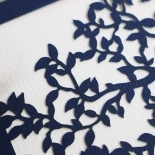 The laser cut pocket is intricate and interesting without being over the top. 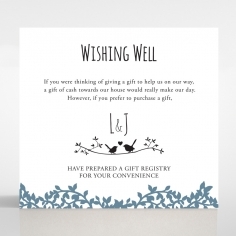 We really like the the feel of the raised lettering, and the ribbon and birds are a nice touch. The colours work well together and it looks stylish without looking too "princessy". This will most likely be the invite we choose for upcoming wedding.